Hi friends! I hope you are having a good weekend! We are ok. Dustin is still sick, no fun! We have no plans this weekend so it will just be taking it easy. Here's an easy card that I made at my friend Gina's house a couple weeks ago. I borrowed her awesome Martha Stewart border punch for this card. I love that punch, I might have to buy it! I made this card with elements from Echo Park's Victoria Gardens. 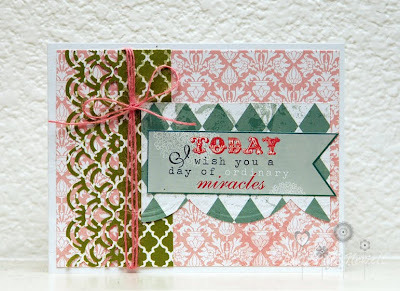 I love love love this paper line! The sentiment sticker is one of my favorites! I love the idea of ordinary miracles! I finished with some May Arts burlap string. Beautiful!! Love the color combo and that punch IS gorgeous! That sticker is awesome!